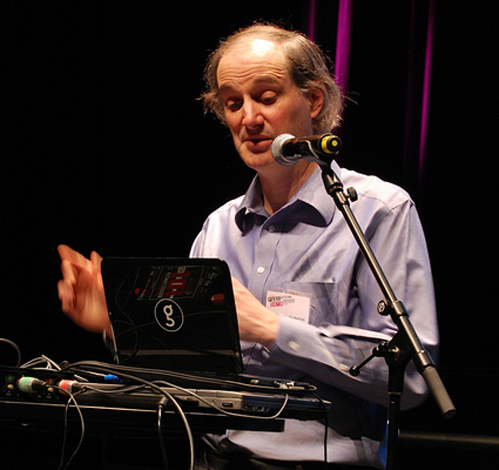 Miller Puckette is a U.S. mathematician, famous in the musical context for his developing work of music software. He is the developer of Max/Msp and Pure Data, two of the most important programming languages for musical and multimedia applications. Together with Cort Lippe and Zack Settel, formed the multimedia music project named Convolution Brothers. Miller Puckette studied as mathematician, graduated at MIT, Boston, in 1980. Here, he stay up to about 1987. The previous year he won the prestigious William Putnam Mathematical Competition for undergraduated college students. The years at MIT was certainly very important for him, even for the frequentation of Barry Vercoe, already student of Max Mathews, father of the computer technology for music. Miller Puckette was involved in the collaboration with Barry Vercoe about from 1979 to 1987. In the early years work for a spatialized reverberation project and for a Music 11 real time emulator. He partecipating even to several conference on Computer Music. In 1983, even thanks to this collaboration, started work to the Music500 (also written Music 500) the software that Puckette developed before the most famous Max/Msp. Music500 was completed in 1984, together with M, the music compiler based on Music 11. In the same year that Puckette finished the Music 500, Barry Vercoe develops a first version of the Synthetic Performer. In 1985, Vercoe moves to Paris to complete this project. Even Miller Puckette was invited at Ircam, where he went. This is an important choice, because allowed Puckette to know the 4X processor, designed by Giuseppe Di Giugno and used by Vercoe for the Synthetic Performer. For the digital signal processor of Di Giugno, Miller Puckette began to work for a control software, and with the models of the previous work, in particular that of Music500, Puckette realizes Max/Msp. In 1987, after completing PhD in Mathematics the previous year, Puckette works to rewriting Max/Msp with the C programming language, with the aim to implement the software with computer Macintosh. In the same year he closes his collaboration with the MIT Media Lab, started in 1985, the foundation year. In 1988 realized Patcher, a graphical language for Max/Msp. In other words, its first GUI. From the early Nineties, Max/Msp begins to be sold through the Opcode Systems, a California based company. In 1991 Max/Msp won the prize for the best software of the year according with the Keyboard Magazine, and by the 1999 royalties of Max/Msp were sold to David Zicarelli’s Cycling ’74, that even today by David Zicarelli, that even today takes care of its development. In the early Nineties, Miller Puckette joined the work group of Eric Lindemann, involved at Ircam in a project for the 4X successor. This research group in 1991 has realized the Ircam Signal Processing Workstation (ISPW). For this, Puckette designed a particular version of Max/Msp, named Max/FTS (later renamed JMax) and made available by Ircam for free. In 1994 Puckette was invited to teaching by the Department of Music of the University of California, San Diego. One of the most important fact in these years was the realization, at UCSD, of Pure Data (generally named PD), completed in 1997. In that year, after finishing PD, Puckette, together with Mark Danks, Vibeke Sorensen and Rand Steiger, participates to the Global Visual Music Project, with the aim to developing free software for multimedia application in real time; so PD was the first among these. In 2004 Miller Puckette, that is even a musician, take part to the musical project named Convolution Brothers, together with Cort Lippe and Zack Settel, founders at the Mid-Nineties of this project. In 2006 published The Theory and Technique of Electronic Music, available for free on-line. From 2000 to 2011 was associate Director of the Center for Research in Computing and the Arts (CRCA), UCSD. Miller Puckette, The M Orchestra Language, Proceedings of International Computer Music Conference, Parigi, 1984. Miller Puckette, The Patcher, Proceedings of International Computer Music Conference, Colonia, 1988. Miller Puckette, MAX at Seventeen, Computer Music Journal, Vol. 26 , 2002.